Here is our list of every Apple Home and HomeKit compatible smart home device that we’ve reviewed and read about. We are only going to list devices that have been released to the public (no vapourware). Make sure that the gadgets that you buy has the “Works with Apple HomeKit” image on it. We’ve been fooled several times on Amazon as many vendors will equate their iOS app to being “Apple HomeKit Compatible”. At Smart Home Reviews Eh!, all we’re doing is sharing how we’re getting the MOST out of our homes. We base everything we review on actual usage. When we finally review a product, we rate it based on our scoring system to ensure we rate each product in the same manner. Smart plugs are the simplest device to use with a new smart home. The biggest problem we have with smart plugs generally involves the design as they tend to block the second outlet if installed improperly. We’ll note that iHome iSP8 and iDevices Switch score higher than the rest of the smart plugs because both products are compatible with most smart home platforms. They are also two of the more expensive products so don’t discount the lower-rated products like the Elgato Eve Energy and the Koogeek‘s. Smart home LED lights have made our homes better to live in. There’s no other way to put it. We can’t tell you how great it is to turn up our Lifx lights in our office to maximum brightness (1100 lumens) with a cool color setting (8000k) to start the day. It just sets our minds up to do more reviews everyday! In general, coloured smart home lighting will give your home a different feel. You’ll be surprised at home different your home looks like when you apply one of the Philips Hue scenes. Throw in a Nanoleaf Aurora and you’ve got an amazing smart home lighting setup. Check out what we’ve done here. Smart Home light switches have limited uses in our opinion when compared to smart home LED lights. Smart home light switches are more practical than smart home LED lights as they’re easier to integrate with automations. From our perspective, they are most useful in keeping track if the lights in your home are off or not. We will note that the Lutron Caseta is higher rated due to the higher functionality (two-pole switch). If your room only has a single switch in it, the other smart home light switches should suffice. We’re working on our smart home locks. Stay tuned! We actually had to buy another door in order to do these smart lock reviews. How’s that for actual usage? Looking for a smart home compatible camera for Apple Home? Well, you’ve got one choice! 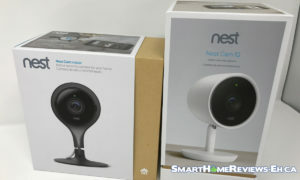 If you’re looking for alternatives, check out our reviews for the Nest Cam Indoor and Nest Cam IQ. We will add that if you don’t need to incorporate the cameras in your smart home automations, using non-Apple HomeKit cameras is quite bearable. We’ve got mixed feelings on smart home sensors. From our perspective, the sensors are either too expensive to be used in large quantities or don’t have enough features to justify the $50+ price. With that being said, the standout sensor is the Elgato Eve Room. Why? Because we discovered that our printer was producing a crazy amount of indoor pollution! We keep the printer off until we need to print things now because of the Elgato Eve Room. You’d think that we’d be all over thermostats but we’re not allowed to touch the thermostat in our house so we’re trying to figure out how to get around that. We’ll be honest, we’re not trying too hard as the house that we’re in doesn’t have AC so the temperature in our house during the summer months is going to be whatever it is. During the winter, well, the temperature is set to 22 degrees celsius (71 degrees fahrenheit) so the added intelligence from the thermostats might not be terrible useful. Are we missing a gadget from our list of every Apple Home and HomeKit Compatible Smart Home Device? Let us know in the comment section below!